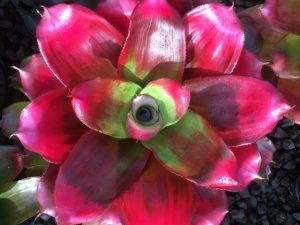 Of uncertain origin is an Aechmea variegate in Perth collections for over 10 years which is not common in Queensland, according to one leading Brisbane grower. 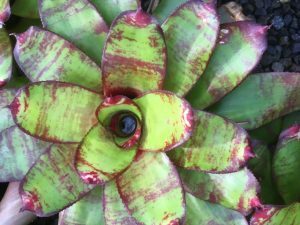 This largish plant to one metre tall had been labelled Aechmea lindenii ‘Variegata’ to distinguish it from the other variegate Aechmea lindenii var. makoyana. Meanwhile the species Ae. lindenii had been reclassified back to its former name of Ae. 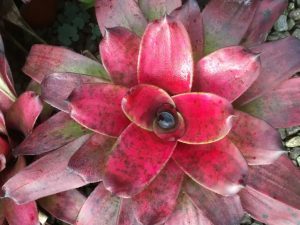 comata (Ref: De Rebus Bromeliacearum 1 [Luther & Sieff, 1994]). The plant itself seems to be midway between Ae. comata and Ae. caudata, not matching any of the species descriptions in the sub-genus Ortgiesia. The rather upright, funnelform rosette has 10-12 mossy-green, leathery but pliant leaves to 90 cms. long by up to 6 cms. wide, each with a slightly purplish base inside and pink flushed outside. The ligulate leaf blades have saw-like tiny 2mm. long brown spines and the leaf tips are rounded and cusped. Variegation is cream to yellow striations through the central leaf blades, not always consistently as some leaves show broad stripes while others are more lineated or in medio-picta form. Unfortunately this variegation is not stable and occasionally reverts to all-green pups. Summer or Autumn-blooming, the erect spike has a densely white flocculose scape 50-70 cms. long. Peeling back the beige papery, 90mm. long narrowly-triangular scape bracts reveals an unusual variegated stem. The inflorescence is polystichous (arranged in rows), dense, cylindrical, to 16 cms. long and 5 cms. diameter, simple but occasionally branched slightly at its base, terminating at the apex in a coma (tuft of hairs). The inflorescence has papery beige 45mm.long primary bracts and 6mm. long floral bracts. The 12mm. long, ovoid-shaped, pale pinkish-orange ovaries are farinose. The 8mm.long golden yellow petals are hooded (black when spent) and the spine-tipped 8mm. long acuminate sepals merge with the ovary colour which soon turns light pink suffused green at the top. Post-floral, the long-lasting spike (3-4 months) ages to burnished orange and finally sets black berries if seed is produced. This variegate’s foliage stripes do not “pink up” in maximum light. 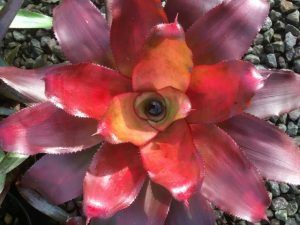 To distinguish it from other allied variegates in this group, it has been decided to name it Aechmea ‘Goldlines’, as this cultivar is probably a hybrid. Reproducing by woody stolons up to 15 cms. long, Ae. ‘Goldlines’ could not be considered prolific, hence its relative scarcity to date. However, as with the approximately 20 species in the sub-genus Ortgiesia, this cultivar is hardy and undemanding in temperate to warm climates and bright, filtered sunlight.